All funds raised will be paid directly to Gates to Gifts for giving away shirts to cancer patients. Plus 50% of all proceeds from shirts will be split between Alexs Lemonade Stand and American Cancer Society..
Gates To Gifts has created Sometimes Angel Are Bald 2018 Taking Down Cancer Tour to help raise awareness and support research for cancer. As well to bring cancer patients together to show support for each other. We are looking for AMAZING COMPANIES to help Sponsor our t-shirt give away to cancer patients. Sometimes Angels Are Bald 2018 Taking Down Cancer Tour Super Sponsorship Information! First off I would like to say THANK YOU, for taking the opportunity to look over our page and seeing how YOUR Company can help us make a HUGE impact for the future. We will be spreading HOPE and ENCOURAGEMENT to cancer patients that are currently fighting cancer and those whom have fought and won their battle. My name is Todd Lewis. I am the owner of a small retail business. We sell home décor merchandise from catalogs. We also focus mainly on fundraising for schools, mission trips and other non-profits. I live in a small town in Indiana with my wife and kids. A few years ago I started a mission to help cancer patients by selling Sometimes Angels Are Bald t-shirts. It started with childhood cancer and now I have expanded my mission to all cancer patients. My plans for 2018 will be the biggest and best yet. 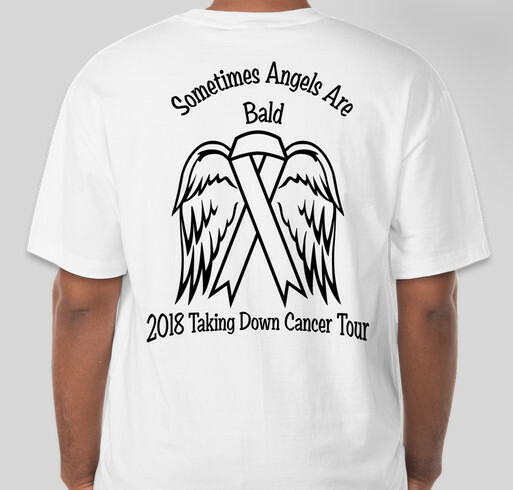 We are going to be hosting the Sometimes Angels Are Bald 2018 Taking Down Cancer Tour. Our goal is to hand out 10,000 to 20,000 Sometimes Angels Are Bald Taking Down Cancer Tour shirts to cancer patients and their families in each state within the continental US and Hawaii. Where does YOUR business benefit and help? Well we have the perfect opportunity for your business to help us reach tens of thousands cancer patients. From February-June of 2018 we are on a express mission to find as many business as possible to buy 5 shirts from this site. So that is ONLY 100.00. When your company buys 5 shirts, your company will be placed in a directory of business sponsors we will be handing out with each shirt. Your companies name will be listed under your state along with address, phone number or website. You get to choose which one. So no matter which state we hand out shirts in, cancer patients will know they have support from businesses across the US. If your business wishes to purchase 20 shirts from this site, your business will also get a shout out post on our Sometimes Angels Are Bald Facebook page. So no matter how large or small your business is, it can help make a difference. From July through the end of December we will be focusing on the actual hand outs of the shirts. Not only will your purchase of shirts go to cancer patients and their family. 50% of all proceeds are going to be split between American Cancer Society and Alex’s Lemonade Stand. Which are both supporters of cures for cancer and much more. As a business and how we have set our campaign up, you should be able to write off this as advertisement cost at the end of the year of 2018. It does take a minimum of 5 shirts to get your business in our directory of businesses that have enabled us to give the shirts away. Steps to get you going! Place your order through this site. Make sure you select the shirts to be delivered to organizer. You may choice to select the size shirts to donate or just make the donation of 100.00 or more and we will order different sizes to give away. 2. When ordering make sure in message/comments to type your businesses name in. 3.Email us at Sometimesangelsarebaldsponsors@gmail.com to talk about how your information will look in the directory. Important info: Gates To Gifts will not allow any sponsors dealing with hate, pornographic material, or any other inappropriate materials. Gates To Gifts has the right not to place any companies deemed to have inappropriate material as sponsors. All rights reserved to Gates To Gifts what is considered inappropriate. Non-business Owners If you have made it to this page as a non-business owner, you can order your own shirt. You will want to select that you would like your shirt come to yourself than the organization. You may also select to send a shirt to the organizer. In this case you agree, you want us to hand the shirt(s) to cancer patients and their families. We are extremely excited to also announce that Brittany Kipfmiller will be helping with our tour. Brittany was diagnosed with Lymphoma cancer 6 months after graduating from high school. She had chest pain, so decided to visit the doctor. They found out that Brittany had developed two masses on her aorta. As Brittany was about to start chemo, they found two more spots. One was on her collarbone and another on her lungs. Brittany was bound and determined to defeat cancer and not let this disease get her down. So with an upbeat and positive attitude she underwent 8 chemo sessions and did exactly what she set out to do, come out a champion. Now Brittany is cancer free and is ready to motivate and help others overcome their battle with cancer. Share Why You Support "Sometimes Angels Are Bald 2018 Taking Down Cancer Tour"